#CamNewton | Bring Your "A" Game Sports Talk! 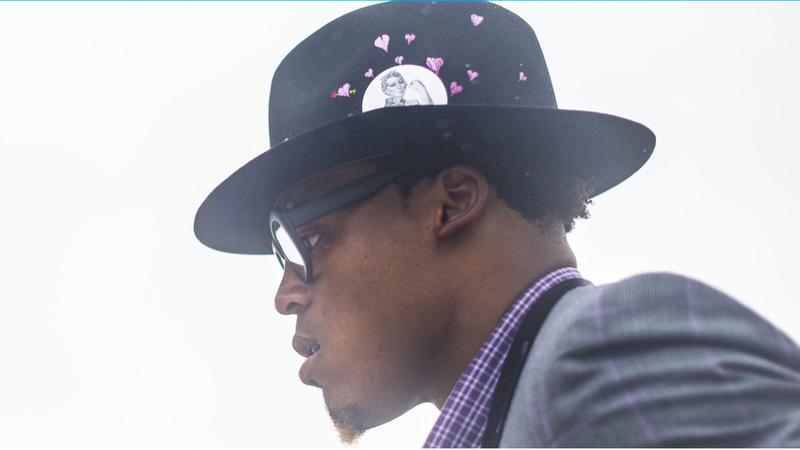 Attempting to win back support after a sexist comment this week, the always fashion-conscious Carolina quarterback Cam Newton made a noteworthy clothing choice on the Panthers’ team flight to Detroit today. Newton wore a hat pin showing the woman from the World War II “We Can Do It!” poster celebrating women working in factories to aid the war effort. (The woman in the poster is often referred to as Rosie the Riveter, although Rosie the Riveter was a separate cultural icon of World War II who only became conflated with the “We Can Do It!” poster decades later.) The “We Can Do It!” woman has become a symbol of feminism and women’s empowerment. After mocking a female reporter’s question this week and losing a sponsor as a result, Newton is attempting to rehabilitate his image. He previously issued a video apology.